Have your language learner hear it, see it, say it, KNOW IT! 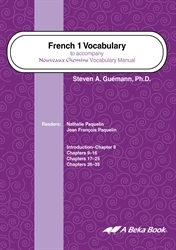 This 2-disk vocabulary CD set pronounces all of the French words from the introductory expressions section as well as chapters 1–35 of the Nouveaux chemins Vocabulary Manual. The listener is instructed to look at the vocabulary manual, listen to the model, and repeat it in the pause provided. Pronunciations are given by both male and female native French speakers with English announcements of each section. Grades 9–12.